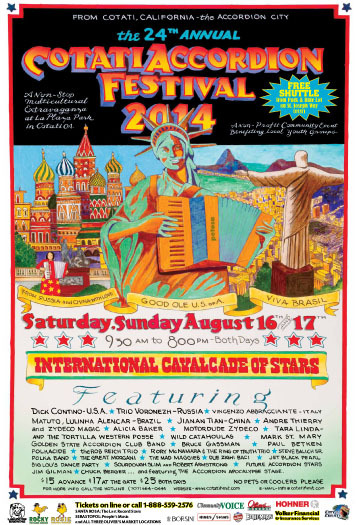 Cotati Accordion Festival. Our show was at 5:30 Saturday and we dished up a fine batch of tunes mostly ones from our new album, Still Standing. Folks danced, plenty took photos and video which I am hoping we get to see. This year’s fest truly were just a few was a “Cavalcade of Stars” from around the world — Sourdough Slim, Bruce Gassman, Trio Voronezh, Vince Abbraciante, Roxanne Oliva, Tara Linda and her Western Serenade to name just a few of the stellar acts. We saw many familiar faces and lots of folks representing with Mad Maggies t-shirts. We made new fans of all ages. One of the pleasures we enjoy, besides playing our show, is hanging with the other musicians at the musician’s swag booth. Everyone helps with selling merch and answering questions from fans. It’s nice camaraderie. Next year will be the 25th annual festival. Mark your calendars August 22nd & 23rd. Everyone should experience this music festival. accordions, Cotati Accordion Festival, live music. 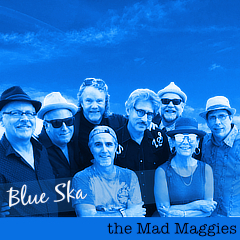 Mad Ms at Lagunitas Brewing Today!